'Go Nuts With Donuts', I possibly couldn't find a better name than this, since I was the first one to go nuts over these donuts. There are certain foods which are always on your wish list and you can wipe them out the moment you get their glance. Donuts do surely top that list and perhaps this was one of those delights that I never thought of experimenting on by myself till a few days back. 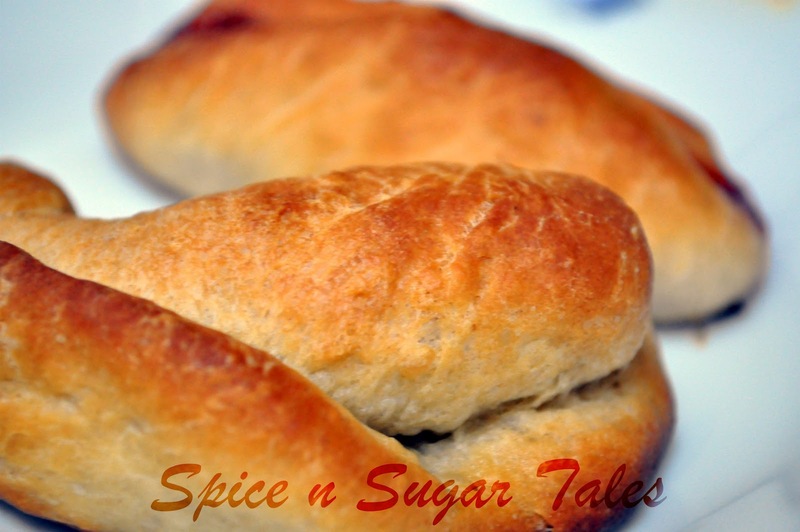 Baking has caught my nerves these days and so is anything with 'yeast'. After my recent successful venture with the braided bread, I was aroused to drive in for something again with yeast, and in the long mile of thinking, I finally concluded over 'Donuts'. I was terribly tensed on how they would turn up because I had never seen anybody making them in my life and nowhere in the weirdest of my dreams did I think of making them. So, this was an out of the blue experiment for me. Donuts are generally deep fried, but I went for a baked version too, which wasn't bad either. As for my first time, with no donut cutters and proper equipments, the trial wasn't a disaster as I had thought of. They turned out pretty well, though the shape had flaws owing to the use of random cutting objects, but in all, it was a cheering and gratifying endeavor. I'm propelled to try the egg-less version soon, and this time I'll look for some bigger, better circles/caps to cut appropriately. I've taken the recipe from here and have made changes in terms of quantity. Sprinkle the yeast over the warm water, and let stand for 5 minutes, or until foamy. In a large bowl, mix together the yeast mixture, milk, sugar, salt, eggs, and 2 cups of the flour. Knead for about 5 minutes, or until smooth and elastic. You can grease your hands with oil to avoid sticking. Place the dough into a greased bowl, and cover. Set in a warm place to rise until double. Dough is ready if you touch it, and the indention remains. Turn the dough out onto a floured surface, and gently roll out to 1/2 inch thickness. Cut with a floured doughnut cutter or if you don't have one, like me, use two different sized caps/circles (one big and the other smaller than it, so as to get the ring shape) to cut. Let doughnuts sit out to rise again until double (around 30-40 minutes). Cover loosely with a cloth. Pre-heat the oven at 180 degrees Celsius for 10 minutes and line the parchment paper on the baking tray or grease it. Heat oil in a deep-fryer or large heavy skillet to 350 degrees F (175 degrees C). Slide doughnuts into the hot oil using a wide spatula. Turn doughnuts over as they rise to the surface. Fry doughnuts on each side until golden brown. Remove from hot oil, to drain on a wire rack. On the other side, for the baked ones, place them in the oven and bake for 10-12 minutes till the top goes light brown. Do not over-bake else they will go hard. Microwave chocolate in a bowl for 30-60 seconds (just enough to melt it) and keep it ready. Dip the top cover of the doughnuts into the molten chocolate while still warm, and set onto wire racks to cool or refrigerate for 5 minutes. Arrange in the plate and wait for no-one or nothing to gulp them over before you do. The baked donuts are not round, but have a flat bottom. Make sure you don't over-bake them else they turn hard. I for sure loved the original deep fried version more, but baked ones make a good choice for calorie-conscious people. 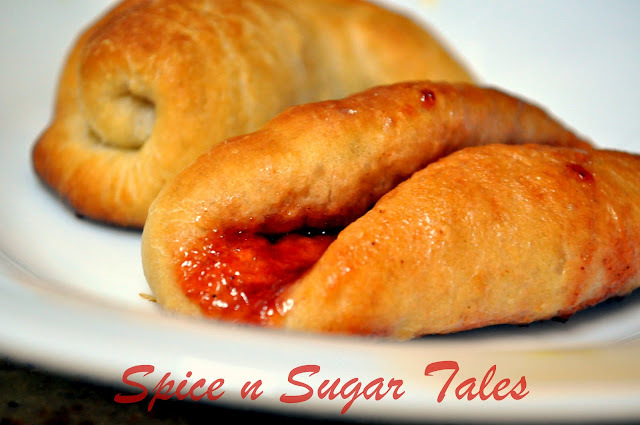 Some dough was not utilized and I ended up making some Baked Jam Rolls/Delights with that. You can go innovative in using that dough in multiple ways. Refrigeration will make them hard, so better re-heat them in an oven before use. Though they are best consumed fresh. You can coat them with sugar-butter-cinnamon syrup and icing sugar or any glaze that you wish. Chocolate glazing was the simplest I found. Appropriate rising is necessary for the perfect texture. Make sure that the dough is kept in a warm place for rising and you do not deep fry/bake them before rising, out of hurry. If planning to make egg-less ones, replace egg with 4tbs curd/yogurt and 1/2 tsp baking soda. The original recipe also uses 'shortening', but since I had none, I skipped it. WOW!!! Looks so delicious.. I like doing donuts at home. Awesome, that's a nice name for the post, they are so tempting especially the chocolate glazed.. Thanks a lot for sharing with Midweek Fiesta.. I like the name along the post and beautiful clicks. 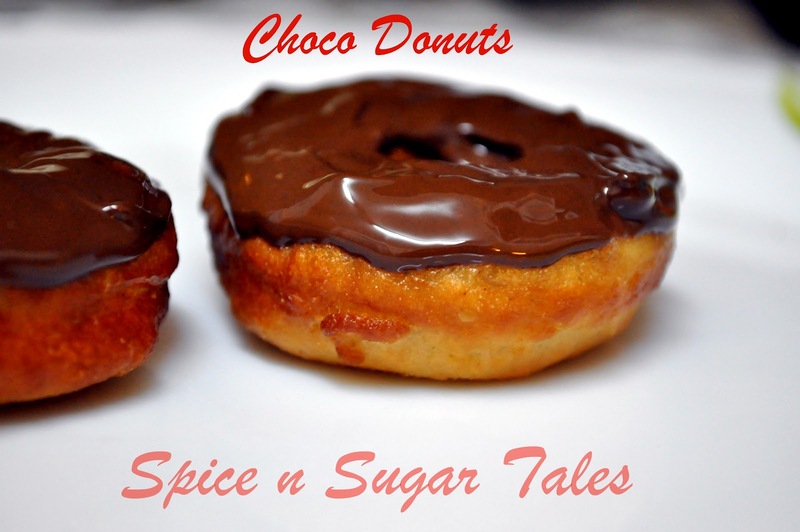 wow yummm...my hubby luvs donuts and i have been wanting to try...ur donuts luk perfect...wil try now...great work anjali !!! looking ver very delicious. my mouth is watering now. 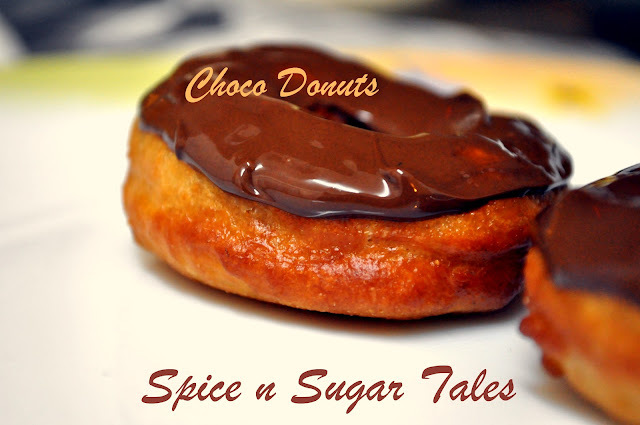 Totally agree with you with the name of this donut ;-) Feel like having it now actually. mmmmmmmm.............look at that chocolate on top! sigh!....lovely anjali...recipe bookmarked! looks really yumm.n nice tempting colour......Thanx 4 this recipe.. I have a dough nut crazy daughter and I am sure she is gonna love these! they look perfect and so yummy! never imagined making donuts at home. looks yummy. will be a sure hit with kids..
My Monthly Event - Spotlight : "Lunchbox Ideas". who can resist the donuts. in bwtn,, we get the mini donut pan here.. I make donuts from the cake batter, they turn out awesome too, easy and fast and guaranteed perfection. Anjali these donuts are making me crave for some right now.I think the name that you have given this is very apt.